La Fura dels Baus will perform an action directed by Pera Tantiñà, within the framework of a show by Lollo Franco and Letizia Battaglia. It will be at the Piano di Palazzo Reale in Palermo during the Festino de Santa Rosalia 2018 in Palermo (Sicily, Italy) that will take place next July 14th. 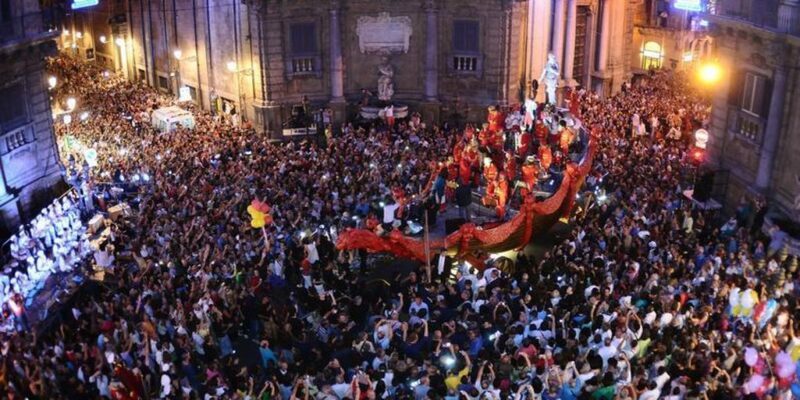 During 3 hours the procession-show will circulate throughout the sicilian city. La Fura dels Baus will recreate the meeting of Santa Rosalia with the Devil and the liberation of Palermo. In the other hand a Human Net will symbolize how the town of Palermo was recovered thanks to the action of the patron. The celebration of the Festino de Santa Rosalía is declared an italian Intangible Cultural Heritage intangible. After nearly four centuries of celebration, Palermo keeps celebrating that Santa Rosalia stopped the plague in Palermo. Every year about 200,000 people comes to the celebration.